Governorates of the Russian Empire during the 19th century in the territory of the later Ukraine: Kiev (1708), Kharkov (1780), Taurida (1783), Volhynia (1792), Podolia (1793), Kherson (1802), Poltava (1802), Yekaterinoslav (1802), and parts of Chernigov, Don Host Oblast (1786), Kursk (1796) and Bessarabia (1871); Malorossiya Governorate (1796) was split into Chernigov and Kherson in 1802. The 1918 administrative division of Ukraine with the green line indicating the extent of the state's territorial claims. Territorial evolution of the Ukrainian SSR 1922–1954. Polish Volhynia gained (1939); Transnistria lost (1940); Transcarpatia gained (1945); Romanian islands gained (1948); Crimea gained (1954). Ukraine emerges as the concept of a nation, and the Ukrainians as a nationality, with the Ukrainian National Revival which is believed started sometime at the end of 18th and the beginning of 19th century. According to Ukrainian historian Yaroslav Hrytsak, the first wave of national revival is traditionally connected with publication of the first part of "Eneyida" by Ivan Kotlyarevsky (1798). In 1846, in Moscow the "Istoriya Rusov ili Maloi Rossii" (History of Ruthenians or Little Russia) was published. During the Spring of Nations, in 1848 in Lemberg (Lviv)the Supreme Ruthenian Council was created which declared that Galician Ruthenians are part of the bigger Ukrainian nation. The council adopted the yellow and blue flag (Flag of Ukraine). Ukraine first declared its independence with the invasion of Bolsheviks in late 1917. Following the conclusion of the World War I and with the peace of Riga, Ukraine was partitioned once again between Poland and the Bolshevik Russia. The Bolshevik occupied territory was made a puppet state of its pocket Communist Party, the Ukrainian Soviet Socialist Republic. In 1922, the Ukrainian Soviet Socialist Republic, together with the Russian Soviet Federative Socialist Republic, the Byelorussian Soviet Socialist Republic and the Transcaucasian Socialist Federative Soviet Republic, became the founding members of the Soviet Union. The Soviet famine of 1932–33 or Holodomor killed an estimated 6 to 8 million people in the Soviet Union, the majority of them in Ukraine. Starting out the World War II with the Nazi Germany and being excluded from the League of Nations, in 1941 the Soviet Union was invaded by Germany and its other allies. Many Ukrainians initially regarded the Wehrmacht soldiers as liberators from Soviet rule, while others formed an anti-German partisan movement. Some elements of the Ukrainian nationalist underground formed a Ukrainian Insurgent Army that fought both Soviet and Nazi forces. Sometime after the deportation of Crimean Tatars, in 1954 the Crimean Oblast was transferred from the RSFSR to the Ukrainian SSR. With the dissolution of the Soviet Union in 1991, Ukraine became an independent state, formalised with a referendum on December 1. With the 2004 enlargement of the European Union, Ukraine now became an area of overlapping spheres of influence of the European Union and the Russian Federation. This manifested in a political split between the "pro-Russian" Eastern Ukraine, and the "pro-European" Western Ukraine, leading to an ongoing period of political turmoil, beginning with the "Orange Revolution" of 2004, and culminating in 2014 with the "Euromaidan" uprising and the Crimean Crisis, in which Crimea fell under the control of the Russian Federation. In Little Russia [i.e. Ukraine]. 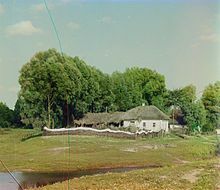 Photo by Sergei Prokudin-Gorskii, between 1905 and 1915. Following the 17th century failed attempt to regain statehood in form of Cossack Hetmanate, the future Ukrainian territory again ended up divided between three empires, the Russian Empire, the Ottoman Empire and the Polish-Lithuanian Commonwealth. In the second half of the 18th century the Catherinine Russian Empire instigated a hysteria in local Eastern Orthodox population by promising protection from Catholicism and support leading to an armed conflict Koliyivshchyna in the neighboring right-bank Ukraine which was part of the Polish-Lithuanian Commonwealth and resulting in the Polish Bar Confederation, Russian military invasion of Poland and its internal affairs, and successful partitions of the last. By the end of 18th century most of Ukraine was completely annexed by Russia. At the same time the Catherinine Russia gradually gained control over the area of Black Sea coast (northern Pontic coast) which was part the Ottoman realm at the conclusion of the Russo-Turkish Wars of 1735–39, 1768–74, 1787–92. The lands were generously given to the nobility and the unfree peasantry were transferred to cultivate the Pontic steppe. Forcing the local Nogai population out and resettling the Crimean Greeks, Catherine the Great renamed all populated places and invited other European settlers to these newly conquered lands: Poles, Germans (Black Sea Germans, Crimea Germans, Volga Germans), Swiss, and others. To the southern Ukraine were deported some Estonian Swedes. Since then there exists the old Swedish village of Gammalsvenskby–Zmiivka. The 1898 congress of Ukrainian writers in Lemberg (Lviv), commemorating the 100 anniversary of publishing of "Eneyida"
Ukrainian writers and intellectuals were inspired by the nationalistic spirit stirring other European peoples existing under other imperial governments. Russia, fearing separatism, imposed strict limits on attempts to elevate the Ukrainian language and culture, even banning its use and study. The Russophile policies of Russification and Panslavism led to an exodus of a number some Ukrainian intellectuals into Western Ukraine, while others empbraced a Pan-Slavic or Russian identity, with many Russian authors or composers of the 19th century being of Ukrainian origin (notably Nikolai Gogol and Pyotr Ilyich Tchaikovsky). In the Austrian Empire most of the elite that ruled Galicia were of Austrian or Polish descent, with the Ruthenians mostly representing the peasantry. During the 19th century, Russophilia was a common occurrence among the Slavic population, but the mass exodus of Ukrainian intellectuals escaping from Russian repression in Eastern Ukraine, as well as the intervention of Austrian authorities, caused the movement to be replaced by Ukrainophilia, which would then cross-over into the Russian Empire. When World War I and series of revolutions across Europe, including the October Revolution in Russia, shattered many existing empires such as the Austrian and Russian ones, people of Ukraine were caught in the middle. Between 1917 and 1919, several separate Ukrainian republics manifested independence, the anarchist Free Territory, the Ukrainian People's Republic, the West Ukrainian People's Republic, and numerous Bolshevik revkoms. As the area of Ukraine fell into warfare and anarchy, it was also fought over by German and Austrian forces, the Red Army of Bolshevik Russia, the White Forces of General Denikin, the Polish Army, anarchists led by Nestor Makhno. Kiev itself was occupied by many different armies. The city was captured by the Bolsheviks on 9 February 1918, by the Germans on 2 March 1918, by the Bolsheviks a second time on 5 February 1919, by the White Army on 31 August 1919, by Bolsheviks for a third time on 15 December 1919, by the Polish Army on 6 May 1920, and finally by the Bolsheviks for the fourth time on 12 June 1920. The defeat in the Polish-Ukrainian War and then the failure of the Piłsudski's and Petliura's Warsaw agreement of 1920 to oust the Bolsheviks during the Kiev Operation led almost to the occupation of Poland itself. In course of the new Polish-Soviet War purpose of which changed from the 1920 led to the signing of the Peace of Riga in March 1921, and after which the part of Ukraine west of Zbruch had been incorporated into Poland, and the east became part of the Soviet Union as the Ukrainian Soviet Socialist Republic. The capital of Ukrainian Soviet Socialist Republic was Kharkiv; in 1934, the capital was relocated to Kiev. The Ukrainianization program aimed at fostering Ukrainian ethnic identity among the population of Ukraine. This 1921 recruitment poster uses Ukrainian orthography to convey its message, "Son, join the school of Red commanders, and the defense of the Soviet Ukraine will be ensured". The Ukrainian national idea lived on during the inter-war years and was even spread to a large territory with traditionally mixed population in the east and south that became part of the Ukrainian Soviet republic. The Ukrainian culture even enjoyed a revival due to Bolshevik concessions in the early Soviet years (until the early-1930s) known as the policy of Korenization ("indigenisation"). In these years, an impressive Ukrainization program was implemented throughout the republic . Along side this a number of national territorial units were set aside for non Ukrainian ethnic groups . As well as an autonomous republic in the west for Ukraine's Molovian people several national raions including 8 Russian , 7 German , 4 Greek , 4 Bulgarian , 3 Jewish and 1 Polish national raion existed in this period . The rapidly developed Ukrainian language based education system dramatically raised the literacy of the Ukrainophone rural population. Simultaneously, the newly-literate ethnic Ukrainians migrated to the cities, which became rapidly largely Ukrainianised—in both population and in education. Similarly expansive was an increase in Ukrainian language publishing and overall eruption of Ukrainian cultural life. At the same time, the usage of Ukrainian was continuously encouraged in the workplace and in the government affairs as the recruitment of indigenous cadre was implemented as part of the korenisation policies. While initially, the party and government apparatus was mostly Russian-speaking, by the end of the 1920s the ethnic Ukrainians composed over one half of the membership in the Ukrainian communist party, the number strengthened by accession of Borotbists, a formerly indigenously Ukrainian "independentist" and non-Bolshevik communist party. Despite the ongoing Soviet Union-wide antireligious campaign, the Ukrainian national Orthodox church was created called the Ukrainian Autocephalous Orthodox Church (UAOC). The Bolshevik government initially saw the national church as a tool in their goal to suppress the Russian Orthodox Church always viewed with the great suspicion by the regime for its being the cornerstone of pre-revolutionary Russian Empire and the initially strong opposition it took towards the regime change. Therefore, the government tolerated the new Ukrainian national church for some time and the UAOC gained a wide following among the Ukrainian peasantry. A 1934 photo of the DnieproGES hydropower plant, a heavyweight of Soviet industrialization in Ukraine. The change in the Soviet economic policies towards the fast-pace industrialisation was marked by the 1928 introduction of Joseph Stalin's first piatiletka (a five-year plan). The industrialisation brought about a dramatic economic and social transformation in traditionally agricultural Ukraine. In the first piatiletkas the industrial output of Ukraine quadrupled as the republic underwent a record industrial development. The massive influx of the rural population to the industrial centres increased the urban population from 19% to 34%. However, the industrialisation had a heavy cost for the peasantry, demographically a backbone of the Ukrainian nation. To satisfy the state's need for increased food supplies and finance industrialisation, Stalin instituted a program of collectivisation of agriculture, which profoundly affected Ukraine, often referred to as the "breadbasket of the USSR". In the late 1920s and early 1930s, the state combined the peasants' lands and animals into collective farms. Starting in 1929, a policy of enforcement was applied, using regular troops and secret police to confiscate lands and materials where necessary. Many resisted, and a desperate struggle by the peasantry against the authorities ensued. Some slaughtered their livestock rather than turn it over to the collectives. Wealthier peasants were labeled "kulaks", enemies of the state. Tens of thousands were executed and about 100,000 families were deported to Siberia and Kazakhstan. Forced collectivisation had a devastating effect on agricultural productivity. Despite this, in 1932 the Soviet government increased Ukraine's production quotas by 44%, ensuring that they could not be met. Soviet law required that the members of a collective farm would receive no grain until government quotas were satisfied. The authorities in many instances exacted such high levels of procurement from collective farms that starvation became widespread. The Soviet famine of 1932–33, called Holodomor in Ukrainian, claimed up to 10 million Ukrainian lives as peasants' food stocks were forcibly removed by Stalin's regime by the NKVD secret police. As elsewhere, the precise number of deaths by starvation in Ukraine may never be precisely known. That said, the most recent demographic studies suggest that over 4 million Ukrainians perished in the first six months of 1933 alone, a figure that increases if population losses from 1931, 1932 and 1934 are also included, along with those from adjacent territories inhabited primarily by Ukrainians (but politically part of the Russian Federated Soviet Socialist Republic), such as the Kuban. The Soviet Union suppressed information about this genocide, and as late as the 1980s admitted only that there was some hardship because of kulak sabotage and bad weather. Non-Soviets maintain that the famine was an avoidable, deliberate act of genocide. The times of industrialisation and collectivisation also brought about a wide campaign against "nationalist deviation" which in Ukraine translated into an assault on the national political and cultural elite. The first wave of purges between 1929 and 1934 targeted the revolutionary generation of the party that in Ukraine included many supporters of Ukrainization. The next 1936–1938 wave of political purges eliminated much of the new political generation that replaced those that perished in the first wave and halved the membership of the Ukrainian communist party. The purged Ukrainian political leadership was largely replaced by the cadre sent from Russia that was also largely "rotated" by Stalin's purges. As the policies of Ukrainisation were halted (1931) and replaced by massive Russification approximately four-fifths of the Ukrainian cultural elite, intellectuals, writers, artists and clergy, had been "eliminated", executed or imprisoned, in the following decade. Mass arrests of the hierarchy and clergy of the Ukrainian Autocephalous Orthodox Church culminated in the liquidation of the church in 1930. The breaking of the siege of Lviv by Poles (November 1919) and the Polish border at the Zbruch River by the war's end, with eastern Galicia (shown in blue) under the Polish control. Following the end of World War I, the eastern part of the former Austrian province of Galicia, as well as Volhynia, which had belonged to the Russian Empire, became the area of a Polish-Ukrainian War. The Ukrainians claimed these lands because they made up the majority of population there (except for cities, such as Lviv), while the Poles saw these provinces as Eastern Borderlands, a historical part of their country. The war was won by the Poles, and their rule over these disputed lands was cemented after another Polish victory, in the Polish-Soviet War. While some Ukrainians supported Poland, their hopes for independence or autonomy were quickly dashed. In the interbellum period, eastern Galicia was divided into three administrative units — Lwów Voivodeship, Stanisławów Voivodeship, and Tarnopol Voivodeship, while in Volhynia, Wołyń Voivodeship was created. The Ukrainian majority of these lands was often treated as second class citizens by the Polish authorities. 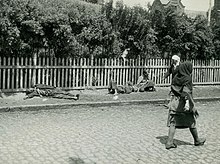 The conflict escalated in the 1930s, with terrorist actions  of the Organization of Ukrainian Nationalists resulting in increasingly heavy-handed actions by the Polish government. The tensions were further exacerbated by arrival of thousands of osadniks, or Polish settlers, who were granted land, especially in Volhynia. Henryk Józewski advocated a self-governance autonomy for Ukrainians in Volhynia 1928–1938. Polish rule over the provinces ended in September 1939, following Nazi and Soviet attack. After the Battle of Lviv, units of the Red Army entered regional capital, Lviv, and following the staged Elections to the People's Assemblies of Western Ukraine and Western Belarus, both eastern Galicia and Volhynia were annexed by the Soviet Union. Now [Poland] is a fascist state, oppressing the Ukrainians, Belorussians and so forth. The annihilation of that state under current conditions would mean one fewer bourgeois fascist state to contend with! What would be the harm if as a result of the rout off Poland we were to extend the socialist system onto new territories and populations. Historian Geoffrey Roberts notes that the comments marked a change from the previous "popular front" policy of Communist Party cooperation with other parties. He adds, "Stalin's immediate purpose was to present an ideological rationale for the Red Army's forthcoming invasion of Poland" and his main message was the need to avoid a revolutionary civil war." Historian Timothy D. Snyder suggests that, "Stalin may have reasoned that returning Galicia and Volhynia to Soviet Ukraine would help co-opt Ukrainian nationalism. Stalin perhaps saw a way to give both Ukrainians and Poles something they wanted, while binding them to the USSR." Ukrainian SSR in 1940, after the Soviet invasions of Poland and Romania and before the German invasion of Soviet Union. Soviet soldiers preparing rafts to cross the Dnieper during the Battle of the Dnieper (1943). The sign reads "To Kiev!". Following the Ribbentrop-Molotov pact, in September 1939, German and Soviet troops divided the territory of Poland, including Galicia with its Ukrainian population. Next, after France surrendered to Germany, Romania ceded Bessarabia and northern Bukovina to Soviet demands. The Ukrainian SSR incorporated northern and southern districts of Bessarabia, the northern Bukovina, and additionally the Soviet-occupied Hertsa region, but ceded the western part of the Moldavian ASSR to the newly created Moldavian SSR. All these territorial gains were internationally recognized by the Paris Peace Treaties, 1947. When Nazi Germany with its allies invaded the Soviet Union in 1941, many Ukrainians and Polish people, particularly in the west where they had experienced two years of harsh Soviet rule, initially regarded the Wehrmacht soldiers as liberators. Retreating Soviets murdered thousands of prisoners. Some Ukrainian activists of the national movement hoped for a momentum to establish an independent state of Ukraine. German policies initially gave some encouragement to such hopes through the vague promises of sovereign 'Greater Ukraine' as the Germans were trying to take advantage of anti-Soviet, anti-Ukrainian, anti-Polish, and anti-Jewish sentiments. A local Ukrainian auxiliary police was formed as well as Ukrainian SS division, 14th Waffen Grenadier Division of the SS Galicia (1st Ukrainian). However, after the initial period of a limited tolerance, the German policies soon abruptly changed and the Ukrainian national movement was brutally crushed. Some Ukrainians, however, utterly resisted the Nazi onslaught from its start and a partisan movement immediately spread over the occupied territory. Some elements of the Ukrainian nationalist underground formed a Ukrainian Insurgent Army that fought both Soviet and Nazi forces. In some western regions of Ukraine, the Ukrainian Insurgent Army survived underground and continued the resistance against the Soviet authorities well into the 1950s, though many Ukrainian civilians were murdered in this conflict by both sides. Burned out buildings in Kiev during the Second World War. The Nazi administrators of conquered Soviet territories made little attempt to exploit the population's possible dissatisfaction with Soviet political and economic policies. Instead, the Nazis preserved the collective-farm system, systematically carried out genocidal policies against Jews, and deported many Ukrainians to forced labour in Germany. In their active resistance to Nazi Germany, the Ukrainians comprised a significant share of the Red Army and its leadership as well as the underground and resistance movements. Total civilian losses during the War and German occupation in Ukraine are estimated at seven million, including over a million Jews shot and killed by the Einsatzgruppen. Many civilians fell victim to atrocities, forced labor, and even massacres of whole villages in reprisal for attacks against Nazi forces. Of the estimated eleven million Soviet troops who fell in battle against the Nazis, about 16% (1.7 million) were ethnic Ukrainians. Moreover, Ukraine saw some of the biggest battles of the war starting with the encirclement of Kiev (the city itself fell to the Germans on 19 September 1941 and was later acclaimed as a Hero City) where more than 660,000 Soviet troops were taken captive, to the fierce defence of Odessa, and on to the victorious storming across the Dnieper river. According to the researcher Rolf Michaelis who is referring to the SS-Hauptamt's document No. 8699/42, the Police Battalion "Ostland" (Field Post Number 47769) resided in the Reichskommissariat Ukraine in 1941–1942, and was one of the main executioners of the Jews. The Police Battalion "Ostland" was an Ordnungspolizei unit that served in World War II under the command of the Schutzstaffel. The battalion established in October 1941 carried out punitive duties. On June 28, 1941 the town of Rivne (Równe) was captured by Nazi Germany, which later established the city as the administrative centre of the Reichskommissariat Ukraine. In July 1941 the 1st company of the Police Battalion "Ostland" was in Frankfurt, the rest of the battalion was in Rivne. In October 1941 the battalion was sent to Lviv (Lwów). At the time, roughly half of Równe's inhabitants were Jewish. About 23,000 of these people were taken to a pine grove in Sosenki and slaughtered by the 1st company of the Police Battalion "Ostland" between the November 6, and 8, 1941 (1st company). A ghetto was established for the remaining ca 5,000 Jews. As reported on May 11, 1942, ca 1,000 Jews were executed in Minsk. On July 13–14, 1942, the remaining population of the Równe ghetto – about 5,000 Jews – was sent by train some 70 kilometres north to Kostopil (Kostopol) where they were murdered by the 1st company of the Police Battalion "Ostland" in a quarry near woods outside the town. The Równe ghetto was subsequently liquidated. As reported on July 14, 1942: The battalion or elements of it provided security along with the Ukrainische Hilfspolizei for a transport of the Jews from the Riga Ghetto to the Riga Central Station using the wagons (1st company). July 15, 1942 another thousand Jews were executed in the same place. As reported on June 27, 1942, ca 8,000 Jews were executed near the town of Słonim. As reported on July 28, 1942, ca 6,000 Jews were executed in Minsk. In November 1942 the Police Battalion Ostland together with an artillery regiment, and three other German Ordnungspolizei battalions under the command of Befehlshaber der Ordnungspolizei im Reichskommissariat Ukraine and SS-Gruppenführer und Generalleutnant der Polizei Otto von Oelhafen, took part in a joint anti-partisan operation near Ovruch (Owrucz) with over 50 villages burnt down and over 1,500 people executed. In a village 40 people were burnt alive for revenge for the killing of the SS-Untersturmführer Türnpu(u). In February 1943 the battalion was sent to Reval, Estland with Polizei Füsilier Bataillon 293. By March 31, 1943, the Estnische Legion had 37 officers, 175 noncoms and 62 privates of the Police Battalion "Ostland". Kiev was recaptured by the Soviet Red Army on 6 November 1943. During a period of March 1943 to the end of 1944 Ukrainian Insurgent Army committed several massacres on Polish civilian population in Volhynia and Eastern Galicia having every signs of genocide (Massacres of Poles in Volhynia and Eastern Galicia). The death toll numbered up to 100 000, mostly children and women. Late October 1944 the last territory of current Ukraine (near Uzhhorod, then part of the Kingdom of Hungary) was cleared of Germany troops; this is annually celebrated in Ukraine (on 28 October) as the "anniversary of the liberation of Ukraine from the Nazis". After World War II some amendments to the Constitution of the Ukrainian SSR were accepted, which allowed it to act as a separate subject of international law in some cases and to a certain extent, remaining a part of the Soviet Union at the same time. In particular, these amendments allowed the Ukrainian SSR to become one of founding members of the United Nations (UN) together with the Soviet Union and the Byelorussian SSR. This was part of a deal with the United States to ensure a degree of balance in the General Assembly, which, the USSR opined, was unbalanced in favor of the Western Bloc. In its capacity as a member of the UN, the Ukrainian SSR was an elected member of the United Nations Security Council in 1948–1949 and 1984–1985. Over the next decades, the Ukrainian republic not only surpassed pre-war levels of industry and production but also was the spearhead of Soviet power. Ukraine became the centre of Soviet arms industry and high-tech research. The republic was also turned into a Soviet military outpost in the cold war, a territory crowded by military bases packed with the most up-to-date weapons systems. Such an important role resulted in a major influence of the local elite. Many members of the Soviet leadership came from Ukraine, most notably Nikita Khrushchev and Leonid Brezhnev a Soviet leader from 1964 to 1982, as well as many prominent Soviet sportsmen, scientists and artists. In 1954, the Russian-populated oblast of Crimea was transferred from the Russian to the Ukrainian Soviet Republic. However, the relatively underdeveloped industrial branches such as coal- and iron ore mining, metallurgy, chemical and energy industry dominated the republic's economy. Once a Cossack steppe, the southern oblasts of Dnipropetrovsk and Zaporizhzhia were turned into a highly industrialised area with rapidly increasing impact on its environment and public health. A pursuit to energy production sufficient for growing industry led to the gigantic nature-remastering: turning the Dnieper River into a regulated system of large reservoirs. The products of the rapidly developed high-tech industry in Ukraine were largely directed for military consumption, similarly to much of the Soviet economy, and the supply and quality of consumer goods remained low compared even to the neighboring countries of the Eastern bloc. A state-regulated system of production and consumption lead to gradual decrease of quality of life and growing "shadowisation" of retail infrastructure as well as of corruption. The town of Pripyat, Ukraine was the site of the Chernobyl disaster, which occurred on April 26, 1986 when a nuclear plant exploded. The fallout contaminated large areas of northern Ukraine and even parts of Belarus. This spurred on a local independence movement called the Rukh that helped expedite the break-up of the Soviet Union during the late 1980s. On January 21, 1990, over 300,000 Ukrainians organised a human chain for Ukrainian independence between Kiev and Lviv, in memory of the 1919 unification of the Ukrainian People's Republic and the West Ukrainian National Republic. Citizens came out to the streets and highways, forming live chains by holding hands in support of unity. Ukraine officially declared itself an independent state on August 24, 1991, when the communist Supreme Soviet (parliament) of Ukraine proclaimed that Ukraine will no longer follow the laws of USSR and only the laws of the Ukrainian SSR, de facto declaring Ukraine's independence from the Soviet Union. On December 1, Ukrainian voters overwhelmingly approved a referendum formalising independence from the Soviet Union. Over 90% of Ukrainian citizens voted for independence, with majorities in every region, including 56% in Crimea, which had a 75% ethnic Russian population. The Soviet Union formally ceased to exist on December 26, when the presidents of Ukraine, Belarus and Russia (the founding members of the USSR) met in Belovezh Pushcha to formally dissolve the Union in accordance with the Soviet Constitution. And with this Ukraine's independence was formalized de jure and recognised by the international community. Poland and Canada were the first countries to recognize Ukraine's independence (both) on 2 December 1991. The history of Ukraine between 1991 and 2004 was marked by the presidencies of Leonid Kravchuk and Leonid Kuchma. This was a time of transition for Ukraine. While it had attained nominal independence from Russia, its presidents maintained close ties with their neighbours. On June 1, 1996, Ukraine became a non-nuclear nation when it sent the last of its 1,900 strategic nuclear warheads it had inherited from the Soviet Union to Russia for dismantling. ; Ukraine had committed to this by signing the Budapest Memorandum on Security Assurances in January 1994. The country adopted its constitution on June 28, 1996. The Cassette Scandal of 2000 was one of the turning points in post-independence history of the country. Declaration of Independence of Ukraine. As printed on the ballot for the national referendum on December 1, 1991. Protesters at Independence Square on the first day of the Orange Revolution. In 2004, Leonid Kuchma announced that he would not run for re-election. Two major candidates emerged in the 2004 presidential election. Viktor Yanukovych, the incumbent Prime Minister, supported by both Kuchma and by the Russian Federation, wanted closer ties with Russia. The main opposition candidate, Viktor Yushchenko, called for Ukraine to turn its attention westward and eventually join the EU. In the runoff election, Yanukovych officially won by a narrow margin, but Yushchenko and his supporters cried foul, alleging that vote rigging and intimidation cost him many votes, especially in eastern Ukraine. A political crisis erupted after the opposition started massive street protests in Kiev and other cities, and the Supreme Court of Ukraine ordered the election results null and void. A second runoff found Viktor Yushchenko the winner. Five days later, Viktor Yanukovych resigned from office and his cabinet was dismissed on January 5, 2005. Yushchenko at the University of Amsterdam, with chloracne from TCDD dioxin poisoning (2006). In March 2006, the Verkhovna Rada elections took place and three months later the official government was formed by the "Anti-Crisis Coalition" among the Party of Regions, Communist, and Socialist parties. The latter party switched from the "Orange Coalition" with Our Ukraine, and the Yulia Tymoshenko Bloc. The new coalition nominated Viktor Yanukovych for the post of Prime Minister. Yanukovych once again became Prime Minister, while the leader of the Socialist Party, Oleksander Moroz, managed to secure the position of chairman of parliament, which is believed by many to have been the reason for his leaving the Orange Coalition, where he had not been considered for this position. On April 2, 2007, President Yushchenko dissolved the Verkhovna Rada because members of his party were defecting to the opposition. His opponents called the move unconstitutional. When they took the matter to the Constitutional Court, Yushchenko dismissed 3 of the court's 18 judges, accusing them of corruption. During the Yushchenko term, relations between Russia and Ukraine often appeared strained as Yushchenko looked towards improved relations with the European Union and less toward Russia. In 2005, a highly publicized dispute over natural gas prices took place, involving Russian state-owned gas supplier Gazprom, and indirectly involving many European countries which depend on natural gas supplied by Russia through the Ukrainian pipeline. A compromise was reached in January 2006, and in early 2010 a further agreement was signed locking the price of Russian gas at $100 per 1,000 cubic meters in an exclusive arrangement. 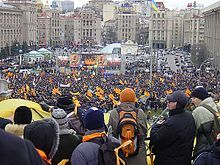 By the time of the presidential election of 2010, Yushchenko and Tymoshenko — allies during the Orange Revolution — had become bitter enemies. Tymoshenko ran for president against both Yushchenko and Viktor Yanukovych, creating a three-way race. Yushchenko, whose popularity had plummeted, refused to close ranks and support Tymoshenko, thus dividing the anti-Yanukovych vote. Many pro-Orange voters stayed home. Yanukovych received 48% of the vote and Yushchenko less than 6%, an amount which, if thrown to Tymoshenko, who received 45%, would have prevented Yanukovych from gaining the presidency; since no candidate obtained an absolute majority in the first round of voting the two highest polling candidates contested in a run-off second ballot which Yanukovych won. Yanukovych was sentenced to 3 years because of theft, looting and vandalism and later had his sentenced doubled. One frequently-cited example of Yanukovych's alleged attempts to centralize power is the August 2011 arrest of Yulia Tymoshenko. Other high-profile political opponents also came under criminal investigation since. On 11 October 2011, a Ukrainian court sentenced Tymoshenko to seven years in prison after she was found guilty of abuse of office when brokering the 2009 gas deal with Russia. The conviction is seen as "justice being applied selectively under political motivation" by the European Union and other international organizations. In November 2013, President Yanukovych did not sign the Ukraine–European Union Association Agreement and instead pursued closer ties with Russia. This move sparked protests on the streets of Kiev. Protesters set up camps in Maidan Nezalezhnosti (Independence Square), and in December2013 and January 2014 protesters started taking over various government buildings, first in Kiev and, later, in Western Ukraine. Battles between protesters and police resulted in about 80 deaths in February 2014. Following the violence, the Parliament turned against Yanukovych and on February 22 voted to remove him from power, and to free Yulia Tymoshenko from prison. The same day Yanukovych supporter Volodymyr Rybak resigned as speaker of the Parliament, and was replaced by Tymoshenko loyalist Oleksandr Turchynov, who was subsequently installed as interim President. Yanukovych fled Kiev. Civil unrest broke out in Kiev as part of Ukraine's Euromaidan protest movement against the government. The conflict escalated rapidly, leading to the overthrow of the government of President Viktor Yanukovych and the setting up of a new government to replace it within a few days. Yanukovych fled to Russia and is wanted in Ukraine for the killing of protesters. Russia in particular holds that the transition was a "coup". Conflict continued with the February–March Crimean crisis when Russian forces seized control of the Crimea region. Crimea was unilaterally annexed by Russia on 18 March 2014. The Crimean crisis was followed by pro-Russian unrest in east Ukraine and south Ukraine. In April 2014 Ukrainian separatists self-proclaimed the Donetsk People's Republic and Lugansk People's Republic and held referendums on 11 May 2014; the separatists claimed nearly 90% voted in favour of independence. Later in April 2014 fighting between the Ukrainian army and pro-Ukrainian volunteer battalions against forces supporting the Donetsk People's Republic and Lugansk People's Republic escalated into the War in Donbass. More than 6,400 people have died in this conflict and according to United Nations figures it led to over half a million people internally displaced within Ukraine and two hundred thousand refugees to flee to (mostly) Russia and other neighbouring countries. ^ a b c Yaroslav Hrytsak. Overview of the History of Ukraine. Part I. ^ "The famine of 1932–33", Encyclopædia Britannica. Quote: "The Great Famine (Holodomor) of 1932–33 – a man-made demographic catastrophe unprecedented in peacetime. Of the estimated six to eight million people who died in the Soviet Union, about four to five million were Ukrainians... Its deliberate nature is underscored by the fact that no physical basis for famine existed in Ukraine... Soviet authorities set requisition quotas for Ukraine at an impossibly high level. Brigades of special agents were dispatched to Ukraine to assist in procurement, and homes were routinely searched and foodstuffs confiscated... The rural population was left with insufficient food to feed itself." ^ "Ukraine remembers famine horror". BBC News. November 24, 2007. ^ a b Encyclopædia Britannica, Ukraine article, page 51. ^ Geoffrey Roberts (2006). Stalin's Wars: From World War to Cold War, 1939–1953. Yale U.P. p. 36. ^ Roberts. Stalin's Wars: From World War to Cold War, 1939–1953. pp. 36–37. ^ Timothy Snyder (2003). The Reconstruction of Nations: Poland, Ukraine, Lithuania, Belarus, 1569–1999. Yale UP. p. 182. ^ Luciuk, Lubomyr Y. (2000). Searching for place: Ukrainian displaced persons, Canada, and the migration of memory. University of Toronto Press. p. 125. ISBN 0-8020-4245-7. ^ Massimo Arico, Ordnungspolizei – Encyclopedia of the German police battalions September 1939 – July 1942, p. 144-145. ^ a b c Stefan Klemp: Nicht ermittelt. Polizeibataillone und die Nachkriegsjustiz. Ein Handbuch. 2. Aufl., Klartext, Essen 2011, S. 296–301. ^ a b c d e Wolfgang Curilla: Die deutsche Ordnungspolizei und der Holocaust im Baltikum und in Weissrussland, 1941–1944. F. Schöningh, Paderborn 2006, ISBN 3506717871. ^ Gilbert, Martin (1986). The Holocaust. London: Fontana Press. p. 403. ISBN 0-00-637194-9. ^ Rolf Michaelis, Eestlased Waffen-SS-is 20. SS relvagrenaderidiviis. Tallinn: Olion, 2001. p. 32. ^ Massimo Arico, Ordnungspolizei – Encyclopedia of the German police battalions September 1939 – July 1942, p. 249-258. ^ Sandford Daniel (February 19, 2014). "Ukraine crisis: Renewed Kiev assault on protesters". BBC News. Retrieved February 19, 2014. ^ "Ukraine crisis: Yanukovych announces 'peace deal'". BBC News. February 21, 2014. Retrieved February 21, 2014. ^ "Profile: Olexander Turchynov". BBC News. February 23, 2014. Retrieved February 25, 2014. ^ "Yanukovych: The man who sparks revolution in Ukraine". Yahoo! News. Agence France-Presse. 20 February 2014. Archived from the original on 1 December 2008. ^ Damien McElroy (23 February 2014). "Ukraine revolution: live – Ukraine's president has disappeared as world awakes to the aftermath of a revolution". The Daily Telegraph. ^ Myers, Steven Lee. "Ousted Ukrainian Leader, Reappearing in Russia, Says, 'Nobody Deposed Me'". New York Times. Retrieved 4 March 2014. ^ "Ukraine's Yanukovich wanted for mass murder". Euronews. 24 February 2014. Retrieved 4 March 2014. ^ Sullivan, Tim (1 March 2014). "Russian troops take over Ukraine's Crimea region". Associated Press. "Ukraine rebels hold referendums in Donetsk and Luhansk". BBC News. 11 May 2014. Retrieved 11 May 2014. "Russian Roulette (Dispatch Thirty-Eight)". Vice News. 13 May 2014. Retrieved 7 July 2014. This page was last edited on 13 April 2019, at 00:59 (UTC).